TaskRabbit.com Reviews - Legit or Scam? TaskRabbit.com Reviews – Legit or Scam? It is hard to catch up in life with limited time in the day. Getting things done with the continuous interruptions of our daily lives can be frustrating. It is easy to be sidetracked by situations and last minute requests, which can leave you in a bind. TaskRabbit’s services are available to provide relief for any personal or business related tasks you need help with, you cannot get to, you do not have time for or you are not able to do yourself. TaskPosters name their own price when they post a task, the price should be carefully calculated. Some factors to think about when calculating your price should include the amount of travel associated with the task, the amount of time it will take to complete the task and the difficulty or special skills a task may require. Remember that TaskRabbit runners do not receive benefits, they do not have growth opportunities and some of them do not have a stable income, so price you task fairly. The TaskRabbit is paid for price of their bid and any reimbursements they are owed. The company charges TaskPosters a fee for their service based on the amount of the bid, the higher the bid, the lower the service charge is. 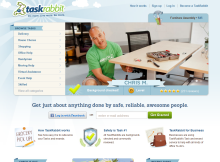 Post your task online through the TaskRabbit website, TaskRabbit runners will bid on your task. You may choose which TaskRabbit is the one for you based on the price of their bids, their experience and skill sets, their location, their demand, or their leader board ranking. The leader board is a point system for TaskRabbit runners to earn points by receiving good reviews, responding quickly with bids, accurately bidding, and encouraging others to join. TaskRabbit runners are fully screened to ensure the safety of TaskPosters. Their identities are verified, they have a thorough background check, and their reputation is reviewed by their personal community. Once they have been approved, they must complete an online training program. This concept, which originated in Boston in 2009, is continuing to expand into new cities to provide others their help. In cities where it is currently located, you can get help anytime, anywhere, from TaskRabbits in your area. There are times where everyone has needed or will need help. TaskRabbits are there to make your life a bit simpler and less stressful by providing the support you need. For the most part individuals who have used the service have left generally positive reviews. Average Rating for " TaskRabbit " is 1.87 out of 5 based on 23 reviews. I have read these responses complaint about their hired help because of a variety of issues but I am amazed but I can't say shocked anymore. The same type of complaints keep dropping up everywhere from people who 1 don't want to do the work themselves. I to belong to such a club. 2. The other group is people who don't know how to do the work. Sometimes I also belong to that group. . I always know the difference and admit immediately and will pay a fair living wage in my city. All of you who complained do you know what your city living wage is??? Not the min. Wage? But enough not to be on food stamps or gov. assistance? Then did you pay for or tip for travel time. Many complain about late arrival. What about your Dr visits. Do you not pay because she was late? What about major traffic and other people just taking up time talking! I saw an old sign of a mechanic repair price per hr. Price if you help double price ? Price if you teach me 4times my hourly rate. Or close to this saying so chill all you hardliners give the man of woman a brake you would want the same courtesy. I hope to find a honest worker.That gives it their best shot. If they can't we both are free to leave and go on... I will go find someone else cause I couldn't or would not do it to begin with. ARE YOU GOING TO DO IT NOW? TaskRabbit is a total scam don't waist your time and money just go on craigslist and find work there it's free. I'm starting to feel like this business is a scam, I completed a few tasks over a week ago and still have not been paid despite the clients paying task rabbit for my services almost immediately after I had sent them the invoice. Also had no response to my emails. Will be cancelling my account if and when I finally receive my money. The business is a farse. I booked on the site for help to to clean a empty apartment to give back to the landlord. charge my credit card for an hour of work. There is no proper customer service to call, only e-mail and text. Well the bottom line is I am not paying some woman who did not work. I am working with the credit card company. I also have a security watch on the card, because if anyone try anything funny they are going to jail. While some rabbits did OK jobs, I had one rabbit who arrived late to a task which he signed up for and caused extreme inconvenience. Another rabbit was worse - basically leaves a task open for weeks and months and did not even respond to emails or inquiries until I contacted the taskrabbit customer service asking for refund. Task ended up not completed based onthe direction but I was still charged with the expense. It should be highlighted as huge warning prior to any usage that the company does not offer any type or sense of liability or responsibility over the actual completion or quality of the completion of the tasks (making the system prone to abuse). The company would simply remove the customer displaying any dissatisfaction with the service to avoid issuing refund or getting negative reviews. I booked a tasker to assemble my flat pack yesterday. After 3.5 hours I was told that the cupboard was damaged and that he wouldn't be able to complete the task. My walls were damaged in two spots in the process. We both had to call a U.S. number who said they would be in touch and call us back. They didn't. I spent money on 4 calls to the U.S. Each time I had to explain the situation over again. In the evening I exchanged 5 emails with a rep at Taskrabbit UK, who kept asking me for the same information, information that was documented on my chat with the tasker and including pictures. They kept sending me the same email over and over again, hardly changing it and told me that they weren't responsible for paying me back for the damage. That's I would need to be insured. Why the help would I need to be insured for a flatpack??? I communicated that to the rep who still hasn't been in touch. I've sent 4 follow up emails. My cupboards were worth 3250 but that was apparently too much money for them to reimburse me for. I tried the emergency number this morning but the only options available are to leave a voicemail or send emails. Neither of which have got me anywhere. The service I've received has been nothing short of disgusting. Even after the tasker officially took responsibility of everything, they still won't respond and reimburse/ resolve the situation. when they take $5 to do a background check do they charge your credit card much more later? Or do they refund the $5 as promised. I am amazed so many people actually work as taskrabbits. I have tried several times and wasted far too many hours trying to become a tasker. It has all been a colossal waste of time. Today is yet another example. Every Google link to taskrabbit gives me a “page cannot be displayed” error. All in all just a tedious exorcise in frustration. I was initially send in the direction of task rabbit while doing a google search on possible options after unemployment benefits are exhausted. I knew nothing about them, but I thought the theory was good: You earn money. You help someone in your community. Win/win, right? I wanted to be a "tasker." I filled out the application. I answered their questions. The process went very well...then the red flags reared their ugly heads. All this before even being accepted. If you are thinking of becoming involved with task rabbit, either as a client, or as a "tasker", please reconsider. My initial impression is that they are not reputable. Chris, Taskrabbit is more or less a hiring agency. When they charge a client, money will be patched through to your account after they take out their fees. Not sure how you would expect to work through TaskRabbit without giving your banking info, do you think they'd mail you checks? Anyone would be far, far better off just using Craig's list or doing a google search to find someone to do a task rather than using this company. I have lost so much money and time in trying to get some very small and EASY handyman tasks done. First in order to book a task they take your credit card and then when/if the tasker comes, you just get charged an amount. No matter if the job is done, or if it is done in an acceptable way....you get hit with the expense. So my experience with Task Rabbit started when I booked a tasker who was supposed to have superb reviews and charged a very high hourly rate for the priviledge of having him work for me. I was a little bit skeptical at first because they don't even tell you the person's last name. First red flag. Your letting someone into your house and you don't even know their name? The $65 dollar rate he charged is double what I should have paid but I really needed someone to do the work. So we messaged to confirm when and where he would show up. Time came and I had other people waiting to help with the job and he doesn't show up. Keep messaging him to ask if he is still coming and finally he shows up over a hour late, after I have to tell him again where he is to come. Doesn't finish the job because he was late and now has to go and meet his girlfriend, so I ask him what is the process to get him to come back and finish the work. He tells me he can't come back in the next couple of days because he is too busy, but will leave the "task open" so that we can message and agree upon a time for him to come and complete his work. Ok, I'm trying to work with this guy to get this task complete, so I go to message him and the task is closed! No way to contact him, and I got charged for the full amount from the company. So I call the company and they offer me some free hours which is really nice to make up for the bad experience. They tell me to go into the site and book another tasker, let them know when I have done that and they will take care of the charge. So I go back on the site, find another tasker and based upon the site's availability, book him at a reasonable price to do the work. I get a message back from him that "sorry, he is not working that day". What? Why are you showing available and allowing me to book if you are not available? So I message him back asking him for days he is available. I get no response and the site shows I have hired him for the original date. I'm just spinning my wheels here getting nowhere. Leah Busque, CEO of the company there is no doubt you are a brilliant and gifted young woman to have founded this company. But instead of waking up each morning to see how you can drive your company forward (an excerpt of some things you have said), focus should be place on just cleaning up the mess of operations. It is clearly not working and I will never use this site again.